I am thrilled to be participating in the 12 Days of Best Christmas Quilts Blog Tour. If you are new to my blog - WELCOME!! This is where I share my crazy but crafty life as a mom, quilter, knitter, gardener and a deep love of books. I also have a podcast where I chat about all of that and more a few times a month: Crafty Garden Mom on iTunes. 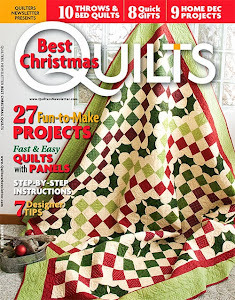 I was so honored to have not one but two projects in Quilters Newsletter's special issue: Best Christmas Quilts. 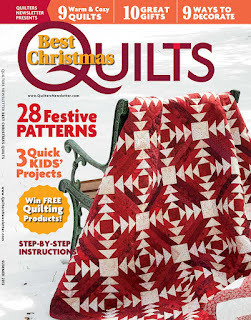 I’m so proud to be a part of this magazine as it is full of beautiful quilt patterns and projects for the holidays. Each of the 28 projects include step-by-step instructions. The issue went on sale on August 21st and is available at newsstands, fabric stores, and quilt shops around the country. It is not included in a QN subscription, but at $9.99 US/CAN for 28 patterns, what a value! You'll find my first project, Selvage Christmas Tree Mug Rugs, on page 21. I have been intrigued and charmed by the colorful selvages that come in much of the quilt fabric on the market today. I've been saving a lot of it up to use in various projects but one day it struck me that little circles look like the bright Christmas ornaments we decorate the tree with every year. Why not add them as a fun element in a quilt project? This pattern is very simple to put together, as the tree is a foundation pieced block. These mug rugs will make great stocking stuffers and teacher gifts, so make a bunch up now and pull them out as the holiday season begins. My second project, Christmas String, can be found on pages 22-23. This is a mini quilt using fusible applique (you could also hand applique these motifs on of course) and a simple embroidered backstich for the string and ornament hooks. I used a swirl motif for the free motion quilting in the background, and outlined each of the ornaments with black thread. Quilter's Newsletter is making this holiday-themed blog tour even more merry by offering this fat quarter bundle of Star Flakes & Glitter by Tina Givens to one lucky winner. To enter, leave a friendly comment on this blog post before 11:59 pm MDT tonight, August 31, 2012, for a chance to win the fabric bundle! GIVEAWAY HAS ENDED I will draw one name at random. One comment per person, please. 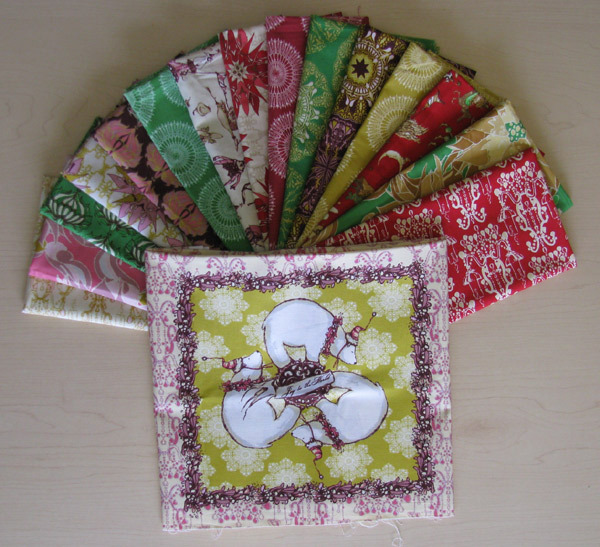 Open to those who haven’t won something from Quilter’s Newsletter in the last 90 days. Make sure you are not a no-reply commenter, or be sure to include your email address in the comment box so QN can contact you when you win!! The winner will be announced on this blog by 9/1. Good luck and thanks for stopping by on the tour! Congrats on the projects being published. I can't wait to do the tree mug rug. WQhat a great use of those cute selvages. Love the mug rugs.Cute! But also the little quilt is so sweet. Thanks for showing us your project and the magazine cover. That will make my search for the issue so much simpler. Congratulations! I'll look for that magazine. Congratulations Tanesha! I love your projects. LOVE the striped binding on each. It really sets the project off. I am definitely going to have to buy this magazine. I have really enjoyed the Blog Tour with the magazines. What a cute idea for using selvages...decorations on Christmas trees! Thanks for the chance! Thanks for the chance of winning the fabric pack. Your Christmas wall hanging is adorable - nice and clean looking and I love the use of stripes on the binding. Both projects are so great. Thanks for sharing your patterns in the magazine. Adorable projects! I am excited to get this magazine. Your Christmas tree coasters are darling! So glad you got the opportunity to be published. Wow! Both projects are super cute! The quilting really sets them off! I just love, love the little trees with the selvages and you're right! They do look like ornaments! Wonderful job! I adore the whimsy of these two projects. What fun these would be to display during the holidays. I have got to get this magazine. So cute!!! Love the swirly quilting, especially. What a wonderful project. Can't wait to see how it was made. Looking forward to getting the magazine. So cute! Love the Christmas String because it looks like fun to make! Love the Christmas tree mug rugs! I love the projects that you made for the magazine! I glanced at your blog. What a wonderful job you are doing as a mother. Your Christmas String project is absolutely darling & so original. Thanks for sharing your creativity with everyone! Really great contributions to the magazine and I listen to you on I Tunes. I love your two projects! I can't wait to get the magazine. Thiese two projects are my absolute favorites in the Xmas issue. Thank you for such great designs. What is it about Christmas lights, no matter what shape, size or form brings a smile to my face? Adorable! Great use of 'scraps'!!! I love your use of selvage, I just gave my five year old granddaughter all the selvage strips I was saving. She was here for a sewing vacation and they caught her eye. Wonder if I could get them back! Both of these projects are very cute. I've been saving selvages, so I'll definitely be making a few mug rugs. Love your use of selvages and the Christmas ornaments project!! Finally - a way to use those selvages. I have been giving them to a member of our guild. Now I will have to save some for myself. Tanesha, your projects are gorgeous! Clean looking and modern. Love the use of the selvige strips on the mug rugs! 2 projects, way to go! love how that selvege looks like ornaments!! thanks fo ra chance at the fabric. 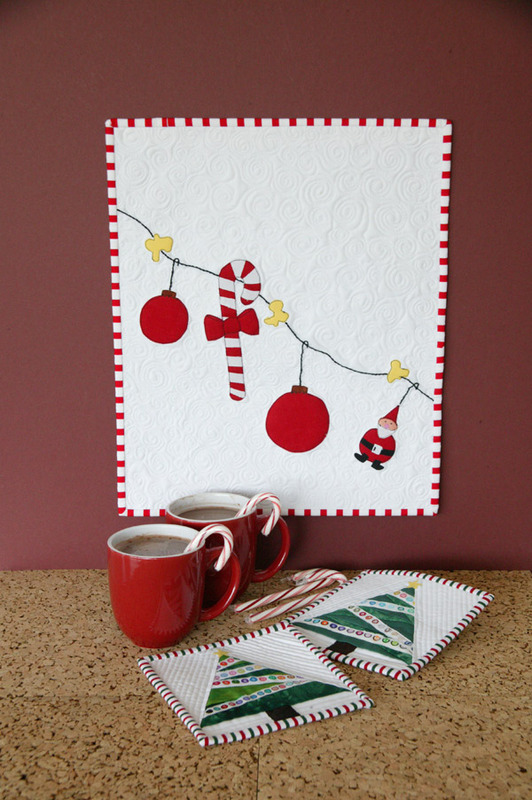 Wow - I love your blog and I now know that I'll be making the mug rugs as Christmas gifts! Love your CHristmas tree coasters! Very ingenious to use the selvage edge! Thanks for the giveaway. What a cute design! Love it! I didn't notice the selvages when I first looked the picture. I thought it was the pattern in the fabric. Now I have a use for all the selvages I save, just in case I need to match a color! What a great idea for the trees! What a wonderful idea, to use the selvage edges as the Christmas tree decorations! The quilted wallhanging is so cheerful and it really makes me excited to get going on Christmas quilting! Thanks. Hi I am not big on decorating for Christmas but the sting of lights is too cute. I might want to hang that in my kitchen. Love your style! Gotta save me some selvedges. I usually forget and they end up at the end of a strip. Very cute designs. I love the whole issue. This opens up a whole world of ideas for those selvedge strips! Love both projects. Thanks. very nice fabric. it's different that the usual colors. The clothesline is great! It would look nice on the kitchen wall next to some muffins Christmas morning. Very cute idea. The little trees are just as cute . Wow! Great use of selvages! I love the pretty colors in the give away fabric too. Charming! Love all the yummy quilting! Love the mug rugs and the little quilt is so cute. Thank you for the giveaway. I love your use of the selvages. Great idea. I love the use of the selvages on the tree mug rugs. Thanks for the great idea! Hi, love your work Tanesha !! !They are so gorgeous! Both are very cute!! Will love to win those wonderful fat quarter bundle, because here in Argentina we can´t buy it!! Thanks for this giveaway!! I love the simplicity of this quilt! It is a wow!!!! Best I've seen on this blog hop! Can't wait to clean my craft area and try something like this!!! Christmas String is just so cute. That is a lovely design for a wall hanging. And the way you used selvage pieces to decorate the trees is cool. Really sweet projects. Thank you. I love the mug rugs....amazing what can be done with the selvage of fabric! Christmas string is great....love the simplicity of it! I love the mug rugs! So cute! Very clever designs! I hope to win because I need to get started on Christmas quilting. Mug rugs could also be ornaments! Very cute ideas. I always through my salvage away. Guess I better start watching for them. Congrats on 2 projects in the magazine. Love the fabric in the give away. I love those mug rugs! What a unique and charming idea! Who would have thought!!! Congrats On the projects! Love your podcast and blog. Well be getting this mag this weekend! Wow! Eyepopping eye candy!! The picture and the mug rugs definitely got my attention. I'm going to look some more at your blog too. Lovely job. Loving the mug rugs. Using the salvages is so clever.TFS! I love this project! You did a great job. I love the mug rugs and darling little quilt. What a great use of those selvedge edges! They have fascinated me, too. I usually give them to my granddaughter, and she uses them in her art creations. She's 6. But now, I think I'll keep a few for myself. Love the wallhanging. so cute. Such cute projects! I love that the Tina Givens fabrics are so fresh and non-traditional - perfect for the contemporary-minded. Always nice to find something to do with the throwaways! I always appreciate anyone who works from scraps! It's like making something from nothing! Nice work! Wow, congrats on being published. How fun is that. Love the projects. I love your Christmas String! Very fun and festive. What a clever idea for the selvages! Too cute! The santa ornament just makes me smile! the coasters were really cute and love the wall hanging. I loveeee your work. They make me happy. I'm reminded by your work of how good primary colors look against a solid white background. With all the wonderful blenders we now have, I think we sometimes forget the power of pure white. Lovely lovely work. I love both of your projects - they are adorable! Both of these projects are cute. I have been saving the selvage dots because I saw them in another project, but this one is even cuter. The trees are really cute and that wallhanging is going on my to-do list, that little elf is just adorable. Thanks. These are soo cute. Would love to make them. I love these whimsical projects. I plan to make the mug rugs as gifts this coming Christmas. Such cute projects. Would be a great birthday present to win the giveaway. Love the mug rugs. So creative to use the selvage as decoration for the tree. I love your idea of using the selvedge as the trim on the trees! Such cute mug rugs! Love the use of the selvage for the decorations. Congratulations on having your patterns chosen for the magazine, they're both so cute, hope you'll have more patterns published in the near future. I just bought the magazine today at my LQS, can't wait to have time to sit at my machine and do some quilting, I love the fast and easy projects. Also those Fat Quarters are fabulous, sure would look good in one of my projects, thanks for the great giveaway. I am just about out of fabric using scraps to make your adorable items and need more for Christmas gifts! thanks for the great pattern and giveaway. I love your designs and I love the fabric. Both of your Christmas projects look fun..also cute. fabric for the giveaway. 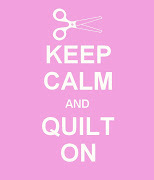 Happy Quilting this long weekend! Way to go! I loved these the first time you showed them to us and I love them still! How nice you had two projects published in the magazine! Congratulations and great projects too!! Cute, cute stuff - really want to make both for the holidays! Adorable - makes me want to get started on Christmas fun stuff! Cute projects for the holidays. Winning that fabric would be great! Congratulations on being published! I've never thought of saving my selvages, looks like something I need to start doing. Thanks for sharing and for the chance at your giveaway. I absolutely love those selvage christmas tree mats! So very creative. I'd love to win that Christmas bundle. I like the idea of using fabric selvage for the Christmas tree trim! Good luck on more successful pattern publishing. Cute projects. Love to be able to use the selvage. Beautiful, you are getting me into the mood. I need to start with my Christmas presents before to long. Thanks for the giveaway, hope I am lucky. So lovely and fresh! Very creative use of selvedges in your sweet mug rugs. Looks like Christmas came early this year! And it's cold here in Oz so feels especially appropriate. Love the projects they are so cute and looks like could be completed quickly as well. I LOVE your great idea for using those colorful selvages! I'm sorry but I had to remove my last comment as I'd neglected to leave my email address as requested. Both of your projects I fell in love with as I was flipping through my magazine. I think they are just wonderful. Using the selvage is adorable on the mug rugs. What a great idea to use it that way. I love the mini quilt. The quilting is great! So many ideas. Tanesha, congratulations on having your projects published. The Christmas String and the Salvage mug rugs are awesome projects for gift giving. Thanks for sharing, happy stitching!! Such cute projects. Thanks for the chance to win. I really like the Christmas String because it is Christmas without being fussy and that fits my lifestyle. The fabrics that are being given away are great especially the green & purple ones. Thank you so much for sharing your designs! I finally got a chance to pick up the magazine today :) I will definitely be making the Christmas String and the mug rugs!! Tanesha love the coasters and will definifely pick up the magazine since im a subscriber and you are a published friend. Cingrats! Wow!! I love both of them. Will have to look for the magazine. Congratulations on having 2 projects in the magazine. I love the coasters, I am always looking for quick fun holiday projects! I love the way you used the selvedges in the coasters. I like your wall hanging too, it is so bright and cheery. Thanks for the chance to win. Such a wonderful idea using the selvage strips in the coasters! They look like little Christmas Lights! Love the wall hanging too! Love the Christmas tree mug rugs. What great designs and use of color! You are so talented! Congratulations, Tanesha, for being published. I loved that ornament wall hanging when you showed it to us last year. I'm so glad that you are releasing a pattern. I love your quilt! It is so adorable and festive for Christmas! Thank you for sharing it with us! Love your idea of the ornaments with the selveges! So clever! What a creative idea to use the selvages as garland!! WOW! Thank you so much for the chance at the giveaway! Great projects for the holidays! I love the little trees with the selveges of fabrics. I have been saving them for awhile but had not done anything yet. This is perfect! Love that these projects won't take months to complete. Can always use small non-complicated projects for those last minute gifts. Wow!!! Your projects are striking! I loved seeing them on Day 10. Have a wonderful Blue Moon evening. There won't be another one until 2015. I love the mug rugs. Lovely! Especially like the mug rugs! Thanks for sharing your ideas. Pretty! I'm hoping to get vchosen! Congratulations - love the giveaway!!! What a great idea for the mug rugs. I am always looking for ways to make something out of nothing and this idea is a keeper. What a creative way to use selvages. Adorable! I love your use of selvages in the coasters, very creative. I also love how eye catching the bindings are on both the wallhanging and the mug rugs. Congratulations on being published! Cute idea for the selvages. This is one I think I would do. Congratulations on being included in a wonderful magazine. So cute! And, I love the tree coasters, using the selvages--so clever!